We have been working a lot lately with overprinting. 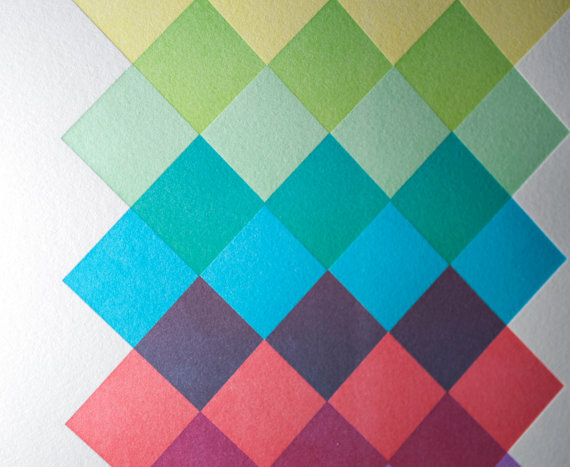 Overprinting refers to the process of printing one color on top of another. Bringing these basic colors together allows us to have an additional color from combing the printed layers. With this overprinting technique, we can achieve colorful results from using just 2-3 colors. In our example we printed 5 colors to produce 9 colors, and while keeping our budget in mind we could use the same design for each printing plate. By just adding an additional color for a total of 6 , we could have produced as many as 37 colors! Early American printer J.F. Earnhart in his book The Color Printer reveals efforts of letterpress printers & designers using overprinting techniques, Earnhart refers this as “harmony of distant colors”. Overprinting is a definite technique considered in our design work and budgets for projects. Print is available for sale in our shop.